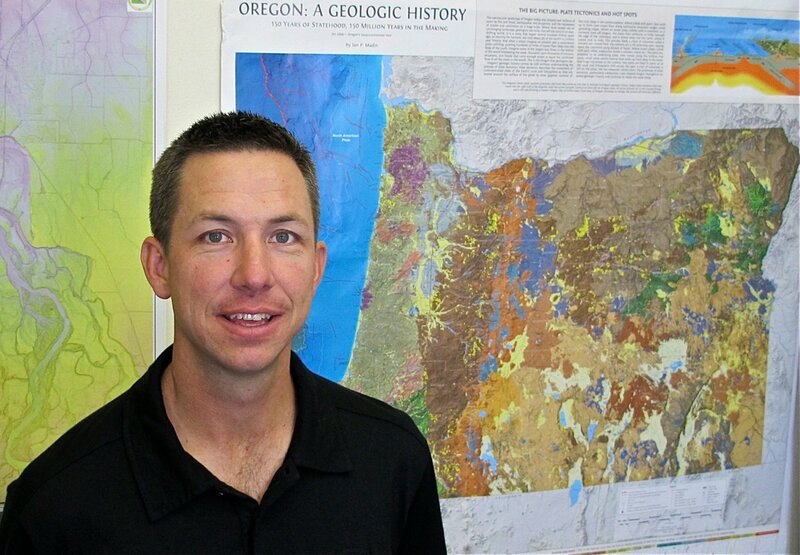 A University of Oregon geology professor's study of the Umpqua River basin in the Oregon Coast Range helps explain natural processes behind the width of valleys – and offers potentially useful details for river restoration efforts designed to improve habitats for coho salmon. Coho salmon thrive in broad, flat valleys that contain multiple auxiliary channels to the main river. Those valleys formed after large landslides altered the landscape, said study co-author Joshua Roering, professor of geological sciences at the UO. The network of secondary channels, while often devoid of water in the dry season, fill and provide a calm, safe haven away from swiftly running currents for the fish during periods of heavy rain and storms. They now have been identified as a critical component of salmon habitat. While geologists and hydrologists long ago documented how river-channel width and depth varies, little had been done to understand how valleys beyond the channels form, and why they may be narrow or wide, Roering said. The study combined on-the-ground observations and a remote-sensing technology known as airborne Light Detection and Ranging (LiDAR). "There are two things that this research tells us," Roering said. "Valleys are things we can see from airplanes or from maps, and they behave, if you let them, in a very simple way. They get wider as the river gets bigger. We've all seen that. "What we've learned here is that if you introduce variable geology and geomorphology -- big landslides, messiness that happens in the world -- the valleys tend to narrow and widen, and fish appear to love that," he said. "They seem to respond to the heterogeneity that is so inherent in most real landscapes. Nature is messy, and the fish have adapted to that." Roering used LiDAR in previous research, including a project in which he and colleagues discovered a dry lakebed that formed some 22,500 years ago by a landslide and later drained in northern California's Eel River basin. That paper -- published in November 2011, in the Proceedings of the National Academy of Sciences -- also connected landslides to a divergence of genetics in two present-day steelhead trout populations occupying the river. Christine May, lead author of the new paper, said Roering's work on landslides and her own previous observations led to the newly published research. May, a biologist at James Madison University in Harrisonburg, Va., was a visiting UO professor under the Meierjurgen Visiting Fellowship at the time of the project. While a graduate student at Oregon State University, May had seen broad valleys and productive fish habitats upstream of ancient landslides while doing fieldwork after 1996 floods. "This observation had lingered in my mind over the years, and when Josh's study on predicting the occurrence of these large landslides on a landscape scale was published I became very excited to pursue this area of research with him," she said. "Correspondingly, my colleague Kelly Burnett with the U.S. Forest Service Pacific Northwest Research Station in Corvallis published a predictive model that mapped the location of potentially productive fish habitat in the same area as Josh mapped the large landslides." Combing the two predictive models, May said it "became apparent that there was a strong linkage between the occurrence of large landslides and the location of highly productive salmon habitat." For the study, May, Roering, Burnett and L. Scott Eaton, also of James Madison University, went into the field, studying the architecture of river valleys. They used LiDAR provided by the Oregon Department of Geology and Mineral Industries, focusing on Harvey and Elk creeks -- part of the Umpqua River basin where Roering previously documented ancient landslides. Researchers measured the widths of the valley using the high-resolution topographic data and showed how widths varied based on watershed-mathematical formulas used to plot and map the terrain. To understand the activities of the salmon, researchers applied topographically derived stream-layering techniques and a formula created by Burnett in 2007 for estimating the "intrinsic potential" of each stream to provide rearing habitats for Coho salmon. They found that valleys downstream of landslides are narrower than would be expected, which suggested that valley constriction had subverted valley widening. Deep-seated landslides caused wide valley segments to occur higher in the channel network than would otherwise be expected. Off-channel streams perched in mountain drainages increase habitat diversity and lead to more abundant salmon. "This study establishes how a valley sets its width," Roering said. "More importantly, the anomalies that make valleys look different are primarily controlled by big landslides in the Oregon Coast Range. Big events occurring thousands of years ago have had a long-running, persistent impact on the valley floor." May said the findings provide fundamental insights on the geological and ecological controls on salmon habitat. "I do believe the results will have broad applications for endangered species conservation and management," she said. The Umpqua River was chosen for the study because of its "amazing uniformity," Roering said. The National Science Foundation funded a portion of the research through a Division of Earth Sciences grant to Roering.